The decline in atmosphere is an issue that worries most Reds. It’ a complex problem with many causes. The advent of all-seater stadia has played its part. Though much safer, football grounds in the premier league era can be soulless places, devoid of culture, imagination and wit. Maybe Anfield has resisted that creeping sterility more than most, but it could never hold out for ever. The ‘Sky Sportsification’ of the game hasn’t helped either. The satellite era has seen the game we love repackaged, rebranded and sanitised for the consumption of sponsors and corporate types. Gone is the genuine irreverent inventiveness of supporters I grew up with; now replaced with generic chants fashioned by advertising gurus and churned out with depressing regularity in grounds around the country. In my youth the humour and songs on the terraces were often fierce, sometimes brutal and always authentic. This was a working class sport and supporters entertained themselves and each other, not TV executives. Undoubtedly the era of the day-tripper has also played a part. Here I’m not talking about the Irish or Scandinavian lads and women I regularly see at the game. Nor am I referring to people who save up small fortunes to travel half way around the world to support the club they usually love from afar. I’ve seen and heard some of these supporters put some Scousers to shame when it comes to singing and supporting the team. However, there is a significant number of paying ‘customers’ at Anfield these days who, shall we say, don’t understand or want to understand the history or culture of the club. The fact they are actively courted by the club at the expense of local supporters, who live and breathe that very history and culture is a crime on a par with the demolition of the original Cavern Club. It is a reckless policy born out of corporate greed and a commitment to the bottom line. I don’t want a ‘Scousers only’ Kop. I don’t believe most Liverpudlians do either. Liverpool is a cosmopolitan city built by ‘foreigners’ after all. What is Scouse, if not a mish-mash of Irish, Scandinavian, Chinese and African culture anyway? However, that shouldn’t mean that local fans should be priced out of their heritage. I accept it’s a balancing act, but it is one the club are getting horribly wrong right now. To be fair they are not alone. Fans of all Premier League clubs are up-in-arms over pricing and groing disenfranchisement. At Anfield our supporters have been at the forefront of this movement. It is something we should be proud of. We’ve seen a boycott of an away game, talks between the club and supporters groups and black flag protests. Despite all of this, the club have so far failed to see the damage they are doing to their relationship with the fans. For me the effects of this ‘head in the sand’ mentality was glaringly obvious at the game with Bordeaux. 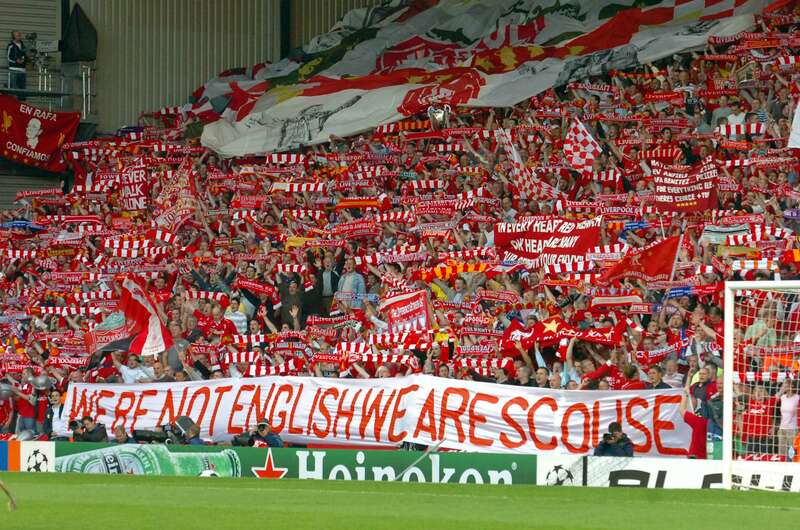 Liverpool and Anfield is famed for its atmosphere on European nights. 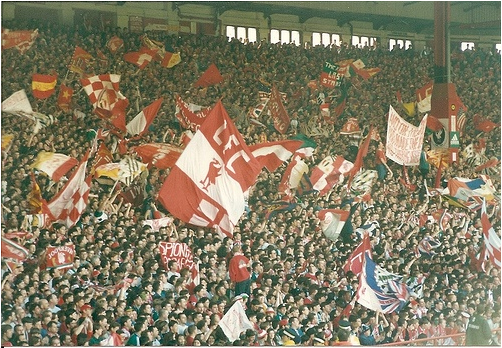 I have stood on The Kop through many of these spectacular encounters, heart bursting with pride. All around me colourful banners swaying under floodlit skies, sound crashing off the roof and walls of that famous old stand; echoing into the moonlit streets beyond. This is the very culture that has attracted countless overseas supporters to follow our club. It’s what keeps them coming back through the lean periods. The sense that Anfield is a special place, where the supporters are different, imaginative and creative. Our banners and flags symbolise all of that. They are what sells the club worldwide – not ‘Dunkin’ Doughnuts’ or ‘Standard Chartered’. Against Bordeaux those banners and flags were gone and the effect was a powerful one. Without the pomp and ceremony associated with our fantastic standard bearers, the old stand is like Samson without his hair. How must it have seemed to the French fans who danced and sung relentlessly behind their own home made banners? As an older Scouse fan I am genuinely concerned that our culture is being strangled. With every passing week I feel less connected with the club I love. I am certain that I’m not alone. Sometimes some of us may allow that frustration to be vented on the wrong people. Yes we need to play our part in generating that distinct atmosphere. I still get annoyed at people leaving early or chants of “who are ya?” from jester hatted drones. However, we need to be clear where responsibility lies, for much of this problem and for the solution. While some supporters don’t help the situation, this is actually not a problem created by supporters of any post-code or point of origin. This is an issue manufactured and perpetuated in the boardroom. It is in the gift of the owners and executives to solve it. The question is do they want to? They need to make their mind up fast, because patience is wearing dangerously thin. Like the city it represents, Liverpool FC welcomes supporters from all over the world, but the club must also welcome and nurture its home grown support. Ian Ayre’s comments on this issue have been covered and dealt with, so I won’t dwell on them. Suffice it to say they have only served to fan the flames and alienate local supporters at a time when the club should be looking to build bridges. What a perverse kind of logic it is to portray Scouse supporters, who live in the shadow or Anfield, as parochial and bigoted, simply because they are requesting fair treatment in pricing and access to the club they love. I believe all supporters from all parts of the globe have a vested interest in ensuring that our voices are heard. The benefits of fair pricing and access will surely be felt by all. The preservation of our unique culture is surely a cause we can all sign up to, wherever we are from. If the club want us to go from doubters to believers, then they need to show us that they value all supporters equally. We need to believe that they don’t see us as a revenue stream and that all of us have a fair chance of seeing our club live. Until then the bond, between club and supporters, that has created the sporting icon, that they now want to sell world wide, will be irrevocably damaged.